2010 Olympic pairs champions Shen Xue and Zhao Hongbo were two of my favorite role models during my early years in pairs. They still are two of my favorite role models. Shen and Zhao demonstrate qualities which make champions as well as people of good character. Following are 4 top tips figure skaters can learn from Olympic pairs gold medalists Shen and Zhao. 1. When a team is a good match, it pays to stay together. Now married, Shen and Zhao have been skating together for 18 years. This time has helped them develop their strong elements, great unison, and overall polish to their skating. Their dedication helped them become two of the very best skaters in the sport. 2. Focus on turning your weaknesses into strengths. In the past, Shen and Zhao had weaknesses artistically, causing them to earn lower scores than the other top teams. They have worked on improving their expression, artistry, and overall skating skills, giving them an edge over the competition. They combined these skating skills with more advanced choreography to create a strong and elegant style. In addition, they now have good unison and speed in their side-by-side spins, formerly their weakest element. 3. Hard work and dedication pay off. I remember when my sister and I were training as intermediate pairs competitors in Colorado Springs during October 2000. Shen and Zhao were training at our rink for the upcoming Skate America competition. We were lucky to be able to train on sessions with the elite pairs. Shen and Zhao would skate for the whole session, going from element to element and hardly ever stopping for a break. The work ethic they possessed was the best I’ve seen. Although they are now married, Shen and Zhao have continued to show intense dedication to their skating, even living in separate dorm rooms to train for the 2010 Olympics. 4. Nice guys (people) do finish first. I’ve only heard good things about what nice people Shen and Zhao are. They have always been very humble and well-mannered. Their sportsmanship has been among the best in the sport, and they have always acted professionally regardless of the competition outcome. Not only are Shen and Zhao great role models for figure skaters, but they are great role models for all athletes. Tessa Virtue and Scott Moir teamed up in 1997. The example of Olympic silver-medalists Meryl Davis and Charlie White adds to this point. Davis and White also teamed up in 1997. 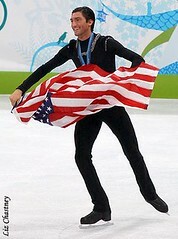 Two long-standing partnerships had the highest results in the 2010 Olympic ice-dance event. 2. Smooth stroking pays dividends. Watch Virture and Moir’s stroking throughout their routines to see the flow and grace it gives them between their moves. Stroking is one of the most important fundamentals of figure skating, and this team has used it to propel them to the top of the world. Virture and Moir’s knees give them the softness of ballet dancers. They practically float across the ice in their free dance with their movements looking effortless. Their knee bend gives them the ability to incorporate some of the most difficult skating maneuvers into their routines. 4. You can be friends with your competitors. I don’t think either of us would be where we are without the other. We help each other on our bad days, and even push it a little more on the good days. 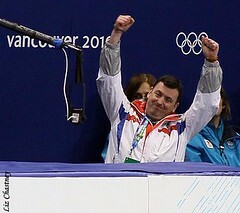 To have each other up there on the podium, side by side, it’s amazing. They’re such great people. I’m sure they wanted to be up on the top of the podium, but they don’t show any of that to us. . . . They’re just such great friends, and they gave us the best hug. Virtue and Moir are great role models not just for ice dancers, but for figure skaters in general. Which of Virtue and Moir’s qualities do you find most helpful? Figure skaters can gain much from following the example of Olympic ladies champion, Kim Yu-Na. Two training tips are especially important. 1. Work on every aspect of your skating. One of the primary elements that sets Kim Yu-Na apart from the rest of the ladies in figure skating is her overall skating ability. Her flow, speed, and artistry are the strongest in the field and come from lots of focus and training on basic skating skills and body and arm movements. On top of that, Kim Yu-Na has phenomenal jumps and spins which she showcases with her amazing performance skills. 2. No matter how much pressure there is in a competition, be aggressive. Kim Yu-Na had incredible pressure as the gold-medal favorite going into these Olympic Games. She had to deal with the hopes of the whole nation of South Korea, expectations as the reigning World champion, and millions of dollars of endorsements. Despite the enormous burden, she pulled though and skated two incredibly strong programs, two of the best in Olympic history. Her speed and aggression into all of her elements helped her achieve this feat. It’s not any time to hold back. It’s not a time to be conservative or cautious. Be Olympic. . . . We’ve talked about that, coming here. You’ve got to be Olympic. You’ve got to be a competitor. Yes, you’re beautiful. Yes, the programs are beautiful. Beautiful lines. Great presentation and choreography. But you’ve got to be Olympic and you’ve got to be fierce. And she was. Watch Kim Yu-Na and other great figure skaters in the Champions Gala tonight!